This base is a versatile cream soup base which can be used to create any cream soup with the addition of your choice of ingredients. CORN STARCH, WHEAT FLOUR, WHEY POWDER, SALT, DEXTROSE, PALM OIL, POTATO STARCH, CORN MALTODEXTRIN, ONION POWDER, SILICON DIOXIDE, DISODIUM GUANYLATE, COLOUR.CONTAINS: WHEAT, MILK. FOR SMALL QUANTITIES: MIX 28 G (APPROX. 1 OZ) CREAM SOUP BASE WITH 225 ML (8 FL OZ) COLD WATER. THEN ADD 225 ML (8 FL OZ) MILK. STIR AND SIMMER FOR 10-15 MINUTES. YIELD APPROX. 3 - 170 ML (6 FL OZ) SERVINGS. FOR LARGE QUANTITIES MIX 450 G (APPROX. 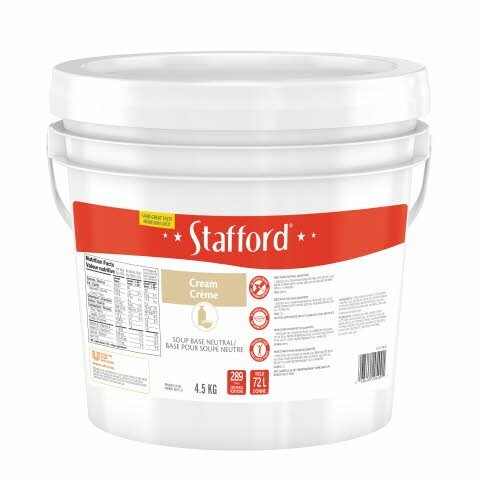 1 LB) CREAM SOUP BASE WITH 3.6 L (126 FL OZ) COLD WATER. THEN ADD 3.6 L (126 FL OZ) MILK. STIR AND SIMMER FOR 10-15 MINUTES. YIELD APPROX. 42 - 170 ML (6 FL OZ) SERVINGS. This base is a versatile cream base which can be used to create any cream soup with the addition of your choice of ingredients. Cream soup base can also be used together with Stafford Chicken Base and other soups, to create many different sauces.